Jet Airways suspends all operations from tonight, last flight to take off at 10:20 pm: Cash-strapped Jet Airways has temporarily suspended all flight operations. The last flight of the airline will take off at 10:20 pm today as it failed to get Rs 400 crore emergency funding from its lenders. Jet Airways suspends all operations from tonight, last flight to take off at 10:20 pm: Cash-strapped Jet Airways on Wednesday temporarily suspended all flight operations. The last flight of the airline will take off at 10:20 pm today as it failed to get Rs 400 crore emergency funding from its lenders. Earlier on March 25, 2019, Jet Airways chairman Naresh Goyal and his wife Anita Goyal had resigned from the board of directors, following pressure from its lenders as the debt burden skyrocketed to Rs 8,000 crore. The airline had already scaled down its domestic and international operations due to fund crunch. 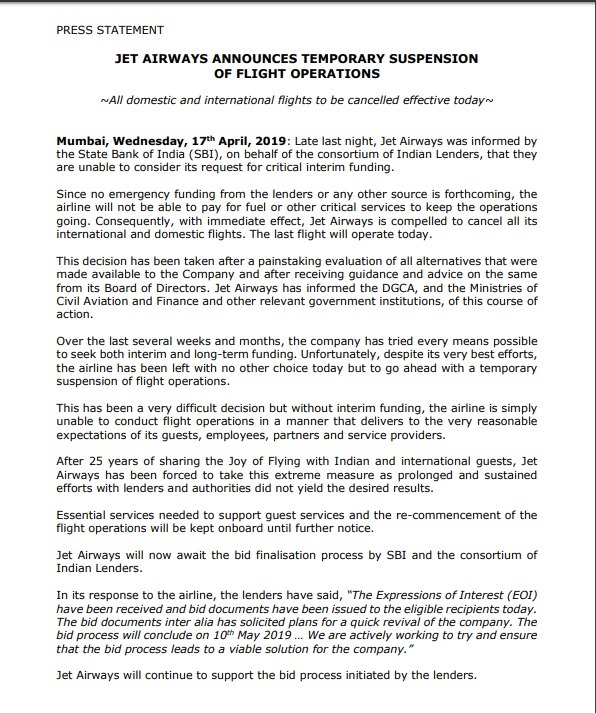 Jet Airways in a statement announced, “Despite its very best efforts, the airline has been left with no other choice today but to go ahead with a temporary suspension of flight operations”. It was also noted that the last flight of the airline will be from Amritsar to Mumbai. The airline further said the decision has been taken after receiving guidance and advice from its boards of directors. It has also informed the Directorate General of Civil Aviation (DGCA) and Ministry of Civil Aviation in this regard. Earlier in the day, fugitive businessman Vijay Mallya extended his support to Mallya and lashed out at the government for allegedly discriminating between state-owned and private airlines. Hitting at the Indian government, Mallya tweeted that he felt sorry to see such a large private airline on the brink of failure despite the government using 35K crores of public funds to bail out Air India. 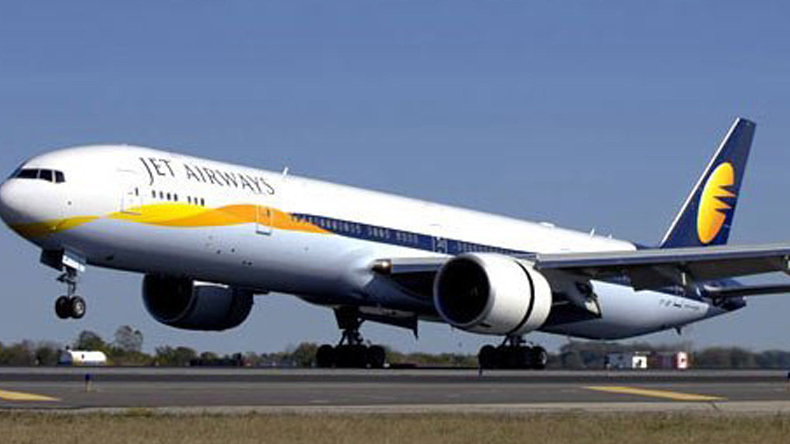 On Tuesday, shares of Jet Airways plunged 18.56% on the BSE amid the rumours of its immediate shutdown. Jet Airways had been promised Rs 1,500 crore as interim funding as part of the deal it signed last month with the lenders. On April 12, 2019, dozens of employees of the troubled airline had staged a demonstration at the Mumbai airport demanding the release of their salaries. Soon after the protests, it was reported that the Prime Minister’s Office had convened an urgent meeting to be chaired by PMO principal secretary Nripendra Mishra with officials of the Civil Aviation Ministry and the Director General of Civil Aviation. Several officials had warned of largescale unemployment if Jet Airways went under, reports said.